State Constitutional Commentary is an annual issue of the Albany Law Review dedicated to the examination of state constitutional law in its broadest sense, from the widest possible range of perspectives. "State constitutional law" itself is meant to encompass all varieties of law—common law, statutes, constitutional provisions, court decisions, etc.—that fall within the expanse often referred to simply as "public law." Accordingly, State Constitutional Commentary is intended to be an interdisciplinary forum for exploring all facets of judicial federalism, the role of state courts, state adjudication, issues of rights and liberties confronting state governments and their courts, and the host of other issues related to state constitutional law. Professor Vincent Martin Bonventre, Faculty Advisor of the Albany Law Review, is the founder and Editor of State Constitutional Commentary. In publishing this special annual issue, the Law Review benefits from the advice of a Professional Board of jurists and scholars from law and law related fields. Former Arizona Chief Justice, Stanley G. Feldman, currently serves as the Chair of the Professional Board. Rutgers University Professor Emeritus, Stanley H. Friedelbaum, a frequent contributor and member of the Professional Board, previously published State Constitutional Commentaries & Notes, the predecessor of State Constitutional Commentary. 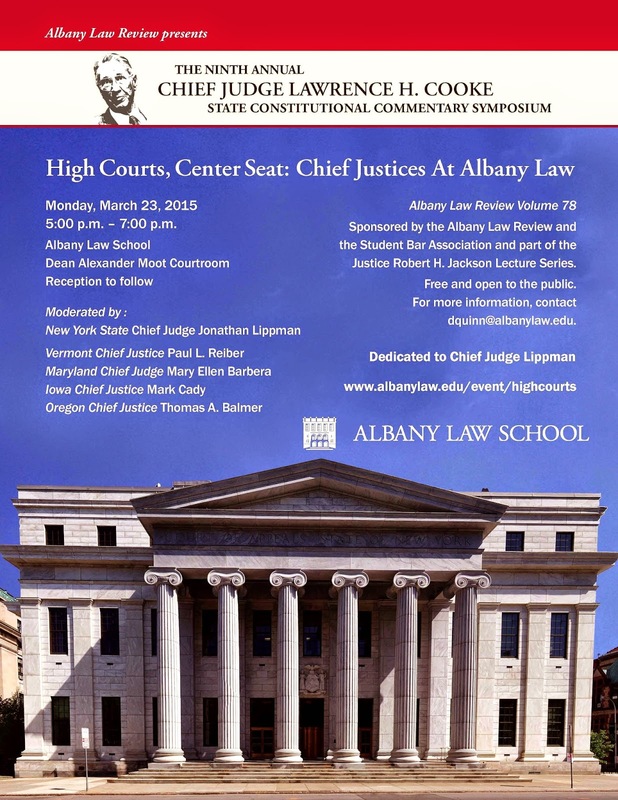 In the Spring of 2007, the Albany Law Review inaugurated an annual tradition of honoring the late New York Chief Judge Lawrence H. Cooke by holding a Symposium in his name. 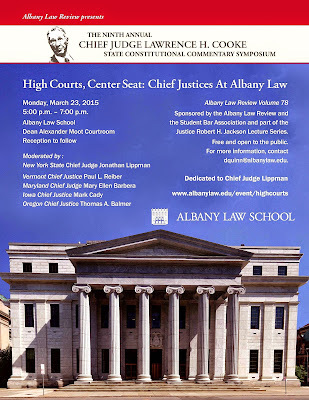 New York's Chief Judge Jonathan Lippman moderated a panel of state Chief Justices from around the country for High Courts, Center Seat: Chief Justices at Albany Law, the 2015 Cooke Symposium. Link to a video of the event HERE. Link to initial flyer HERE. 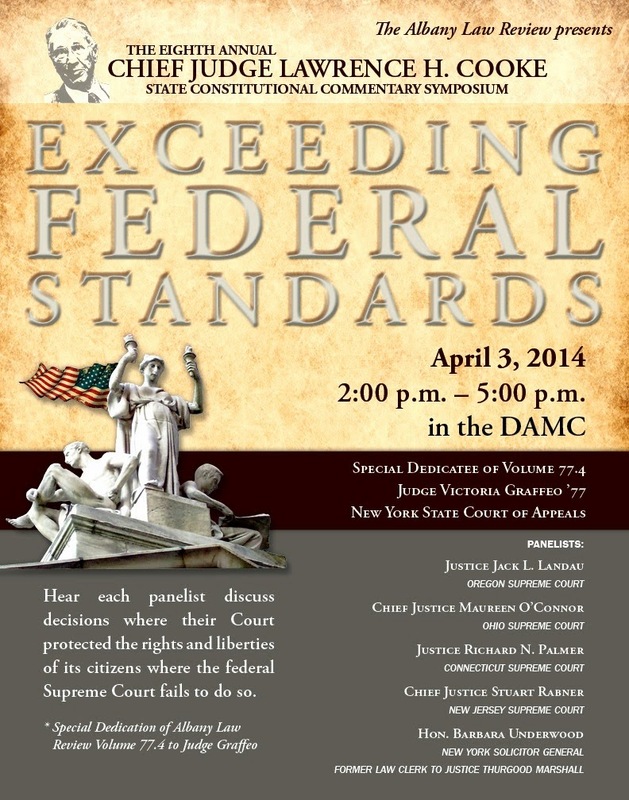 The 2014 Chief Judge Cooke Symposium: state supreme courts from around the country and the New York Solicitor General on Exceeding Federal Standards. 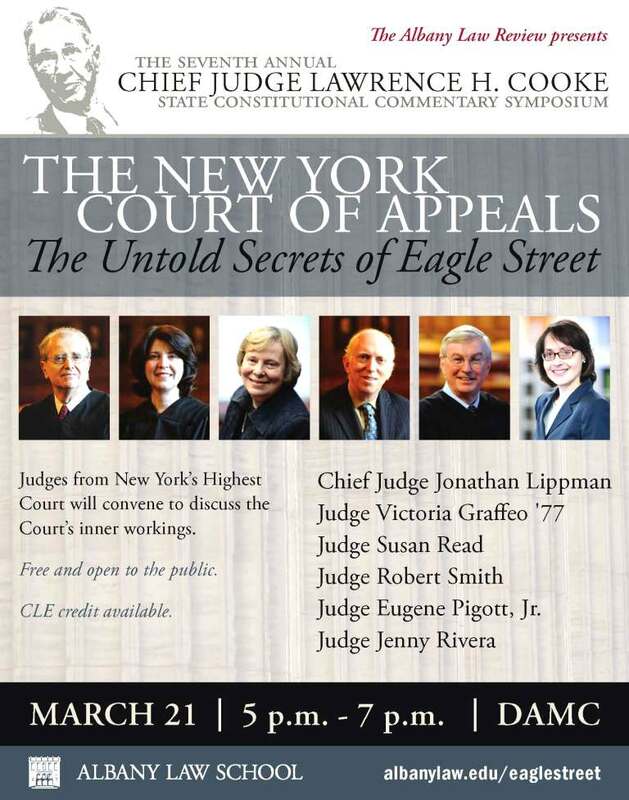 In 2013, the Judges of the NY Court of Appeals: The Untold Secrets of Eagle Street. 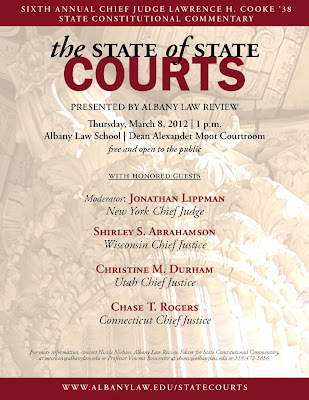 In 2012, The State of State Courts, brought Chief Justices Shirley Abrahamson of Wisconsin, Christine Durham of Utah, and Chase Rogers of Connecticut to speak on a wide array of issues facing state court, in a free wheeling discussion moderated by New York Chief Judge Jonathan Lippman. 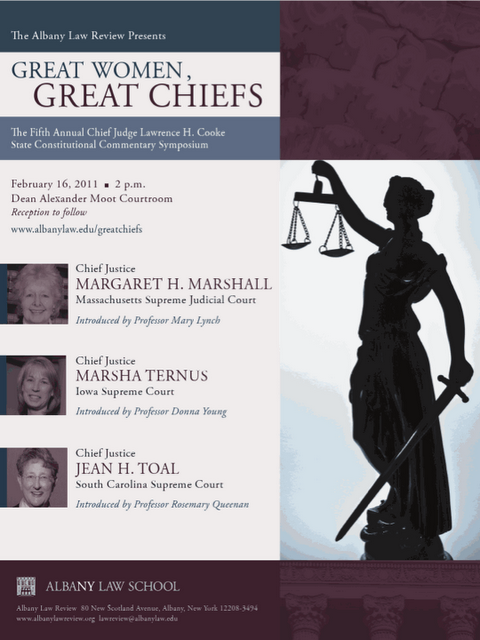 In 2011, the Cooke symposium was Great Women, Great Chiefs featuring three of the nation's most eminent jurists. Chief Justice Margaret Marshall of the Massachusetts Supreme Judicial Court, Chief Justice Marsha Ternus from the Iowa Supreme Court, and Chief Justice Jean Toal of the South Carolina Supreme Court shared their insights as the presiding members of the highest court and the judicial branch of their respective states. In 2010, Wrongful Convictions: Understanding and Addressing Criminal Injustice, the moderator, New York Chief Judge Jonathan Lippman, led a discussion on the origins of and modern solutions to wrongful convictions. To view a video of the event, please click HERE. In 2009, Tough Call: State High Court Judges on Making Their Hardest Decisions, the panel included Acting Chief Justice Maureen McKenna Goldberg of Rhode Island, Associate Justice (retired) John M. Greaney of Massachusetts, Senior Associate Justice Flemming L. Norcott, Jr. of Connecticut, and Associate Judge Robert S. Smith of New York. A podcast of the event is available HERE. 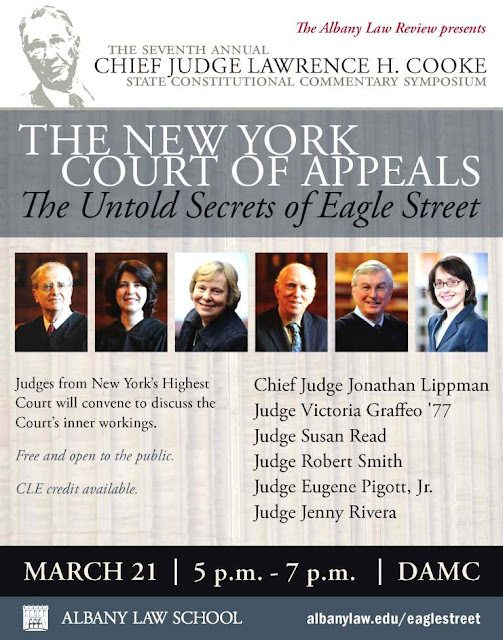 In 2008, Judges on Judges, featured the entire New York Court of Appeals speaking about their favorite judges in the court's history. In 2007, the inaugural year, the symposium featured a Discussion with the Chief Justices, a panel that included Chief Justices James Hannah of Arkansas, Christine Durham of Utah, and Shirley Abrahamson of Wisconsin, as well as then-Chief Judge Judith S. Kaye of New York to whom the symposium was dedicated.